All about Yonex Power Cushion Badminton Shoes 2018| khelmart Blogs | It's all about sports..
1. Cushion provides better comfort and feel to players. 2. Cushion helps in avoiding the injuries to players. 3. Better cushion shoes help offering the extra bounce to player so that player will get maximum energy during movement. 4. Effective cushioning helps in better energy management. 5. As badminton game required lot of body movement within the court. Due to lots of movement, if player shoes are not cushioned than it will create problem to player with some serious injuries. 1. Power Cushion plus is an upgraded version of traditional power cushion technology. In this technology, a special elastic resin material is used which is lightweight in nature. This special resign provide high shock absorbing ability. 2. To further improve the resilience, special grove designed is used at mid sole which provide better optimum spacing results into better resilience. shock absorbing ability with 12% better repulsion. 1. 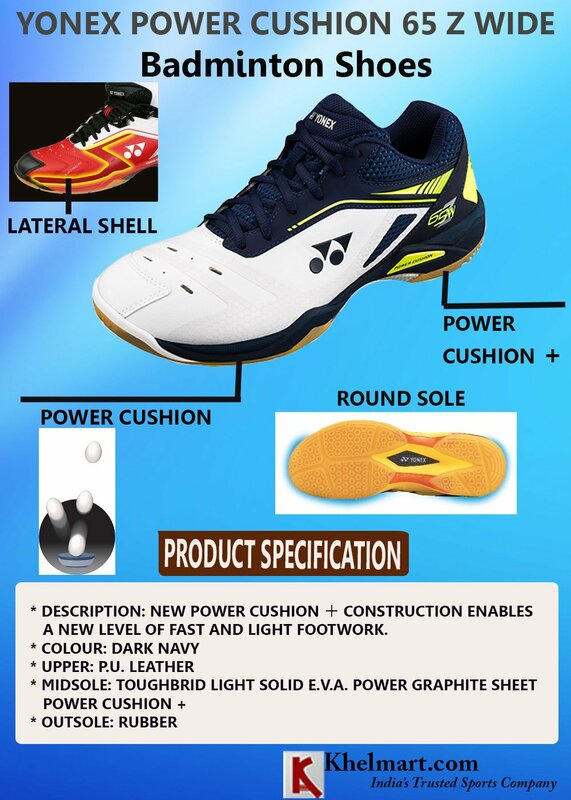 Yonex power cushion technology is basically a combination of cushion material at heel and mid sole. This technology used a very soft but resilience material (Better than urethane) which absorb the shock and impact load and release them slow and steadily. 2. This complete action of absorbing the shock load and release it slowly helps in better comfort and provide better cushion to players. 3. By comparing the other cushion material like urethane, Power cushion provide 3 times better shock absorbing ability. 1. In 3 layer power cushion, 3 layers are used to configure the power cushion. Top and Bottom layers are kept as hard so that it could absorb the 30% more shock as compare to original power cushion. 2. At Middle, very soft material is used which basically quickly return to its original shape. 3. Overall, 3 layer power cushion provide 5% more repulsion for enhanced transfer of energy. 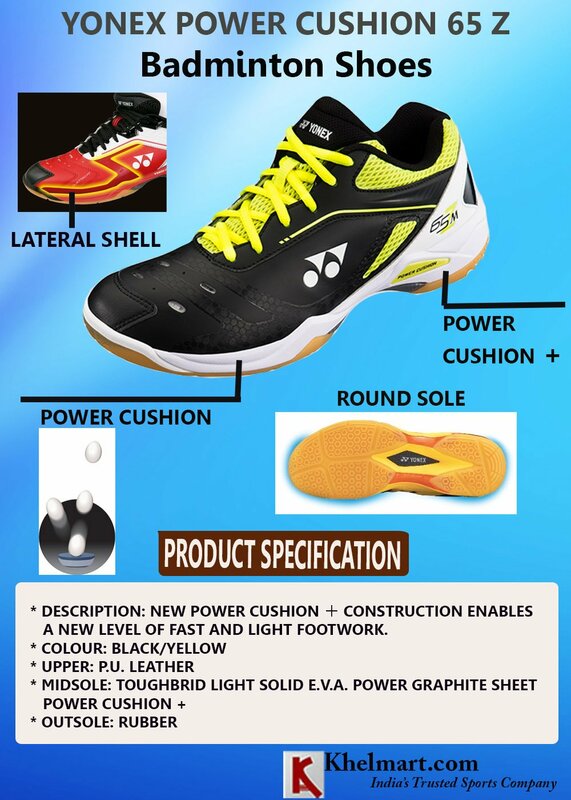 Yonex used these Power cushion technology at different place to get maximum benefits to players. The combination of these technologies in single shoes is a revolutionary technique developed by Yonex to offer best in class comfort to players. This Power cushion badminton shoe is used by lots of international level players. Its design and look is traditional with lots of cut section stitching together. This shoe is launched in two colors (1) Black and yellow (2) White and Black. In first color variant, base color is black which the combination of PU and durable mesh. On black color, Yellow color rocker mesh is provided. Shoe design is simple but looks attractive with Yellow color graphics. Yonex used two power cushion technology in this shoe. Power cushion plus technology is used at mid sole back side. While, power cushion technology is used at front side at mid sole. The combination of two technologies offers best comfort to player. 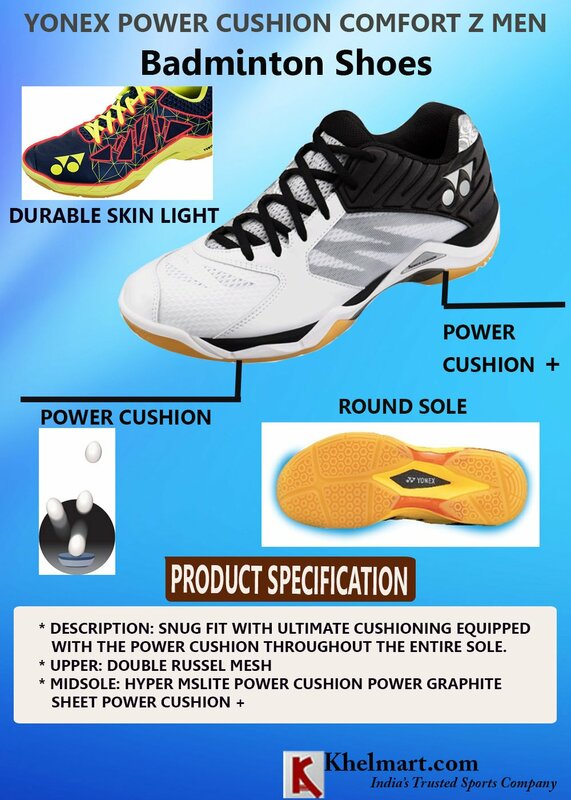 Checkout the Mid range Badminton shoes here Power Cushion shoe is developed for advance badminton players who required extreme cushioning in shoes. Upper of the shoe is made of PU leather, high quality mesh. 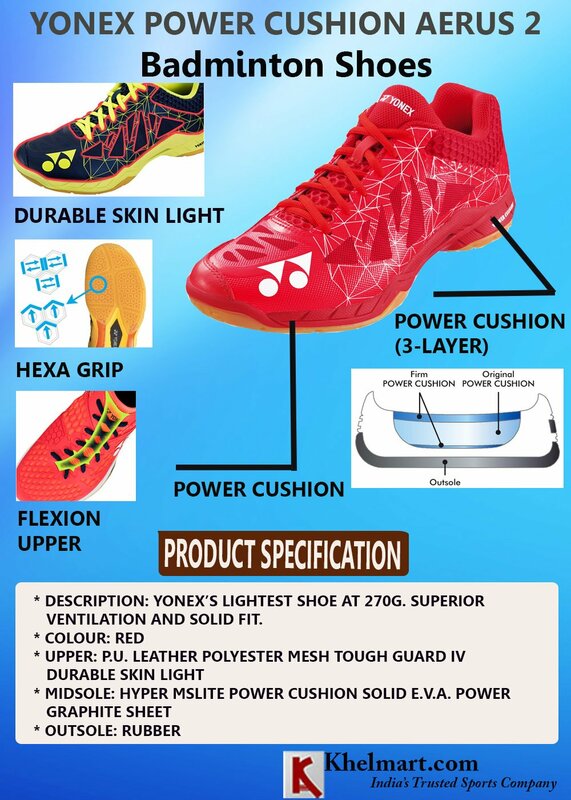 Yonex used all new technologies in this shoes like ToughBrid Light, Solid E.V.A.,Power Graphite Sheet,Power Cushion. It is a different variant of power cushion 65Z shoes. It is developed on wide last concept in which shoe upper is prepared on wide last to offer better comfort and feel. All other specification of shoes is same as 65Z previous model. This shoe is available in single color variant. Base color of the shoe is white and side of upper is made of yellow and black color graphics. 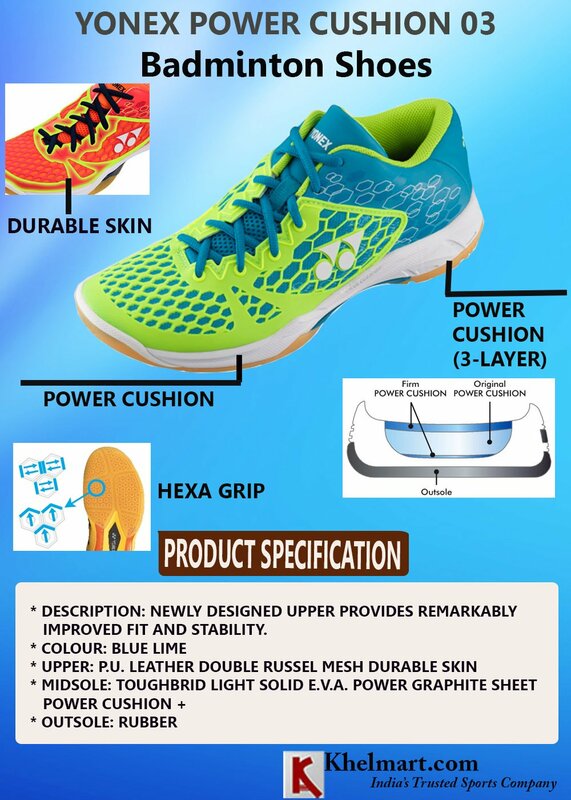 Overall, this shoe is suitable for advance badminton player who wants better cushion and good durability from shoe. Power cushion 03 Z is the latest 2018 badminton shoe model. It is most popular badminton shoes in power cushion series. Its attractive design and looks offers best in class shoe feel to players. It upper is made of die cut sections sheet which is covered with durable mesh. Die cut section is latest concept which is used by Yonex in high end shoes. To improve the fit of the shoe, Yonex used Asymmetric design which is curved eyelet creates a natural snug fit around the inner arch. Yonex used toe assistance shoe which is a toe centric design philosophy that cuts down the pressure from big toe and offers improved support at mid foot. With this type of fitting, power losses is reduced and helps in better footwork. Coral red is most popular and stylish shoes in these two. Yonex Aerus 02 is a hit model in year 2018. Aerus 2 offers two main features (1) its weight (2) Its design. It is the lightest shoes in complete Yonex badminton shoes catalogue. Its weight is around 270gms. This shoe is designed with latest die cut sections in which very thin toe cut section sheet is welded on high quality synthetic mesh material. This shoe is manufactured with latest shoe technology which includes 3 Layer Power cushion, Flexion upper, durable skin light, sysnco fit insole. Yonex used more mesh area in this shoe which results into better ventilation within the shoe. With better ventilation and proper air circulation, player will fell refresh during long practice sessions. This material provide two benefits to players, it offers rubber like flexibility to player so that player can easily flex on court. With flexible upper material player will get added advantage on court covering. DURABLE SKIN LIGHT upper provide better stiffness to maintain fit for long use. So DURABLE SKIN LIGHT materials provide both, flexibility and durability. Yonex used limited stitching concept in this shoe. It means, stitching is used at minimum part of the shoe. Minimum use of stitching provides better style and durability to shoe. In power Cushion comfort z shoe two types of cushioning are used to offer all new feel to players. At mid sole tradition power cushion is used. While at heel area, Power cushion is provide to give soft feel to player. Yonex used the combination of two technologies in this shoe which offers better comfort, cushion and optimized energy transfer to players. Yonex used power cushion in full sole (throughout the entire midsole) in this shoe. These helps in reducing the extra load on heel and thus reduce stress from ankle. To improve the overall performance of the shoe , Yonex used very innovative material known as hyper MsLite which in 10% lighter as compare to traditional mid sole and offer better cushioning. To improve the inner ventilation within the shoe, a new lightweight but durable mesh is used which improve the air circulation within shoe and provide better ventilation. This shoe is available in single color scheme which is white and black. White color microfiber is used while color mesh is used which is lightweight in nature. Overall, this shoe is a best option for advance badminton players.